PEX summer festival will entice and thrill you with a seemingly endless selection of the best DJs the nation has to offer. We are securing top talent from all over the USA to bring you a full lineup for the best dance party the east coast will see this summer! 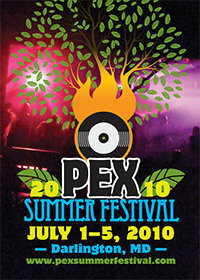 Get ready to dance, play, sing, and interact with your fellow members of the PEX community. The art of our community will be the bedrock of the event, mingling with the physical, mental, emotional and spiritual climate of the three day joy-fest. We want all participants to create art in their own way and invite the people of this gathering to feel free to express themselves openly, respectfully and lovingly through any modality that feels appropriate and nurturing to the highest good of self and all. We aim to nourish you throughout the event. We want to nourish not only your ears, eyes and soul, but also your BODY! We will be offering an affordable meal plan with vegetarian and vegan options. Saturday boasts a 4th of July celebration barbeque for EVERYONE to bring the community together. Our barbeque rolls right into an effigy burn, celebrating peace, unity and transformation. house music, strictly music. Bookmark.